IF THERE is a modern gateway from the east to Africa, it is arguably Addis Ababa’s airport. Passengers passing through its dusty terminals on their way to some far-flung capital will be surprised to find that getting an Ethiopian meal is remarkably difficult. Asian dumplings, however, are available at two different cafés. Signs marking the gates are in English, Amharic and Chinese, as are announcements. Dozing gently on the beige loungers are untold numbers of young Chinese workers waiting for flights. They are part of a growing army of labourers, businessmen and engineers who can be seen directing the construction of roads, railways and ports across much of east Africa. Concerns about China’s involvement in Africa are often overplayed. Accusations that it is buying up vast tracts of farmland, factories and mines, for instance, are blown out of proportion. Even so, its growing influence on the continent has nettled India and Japan, who are both boosting their engagement in response. As with previous rounds of rivalry in Africa, such as during the cold war, at least some of this activity relates to access to bases and ports to control the sea. China’s involvement in Africa now includes a growing military presence. Thousands of Chinese soldiers have donned the UN’s blue helmets in Mali and South Sudan, where several have been killed trying to keep an imaginary peace. Chinese warships regularly visit African ports. China maintains a naval squadron that escorts mostly Chinese-flagged vessels through the Gulf of Aden. But some diplomats fret that China has been using these patrols to give its navy practice in operating far from home, including in offensive actions. “You wouldn’t normally use submarines for counter-piracy patrols,” says one. Patrolling for pirates has also given China an excuse to set up its first overseas base in Djibouti, next door to an existing American one. Yet the more alarmist worries about China—that it is planning to build naval bases in a “string of pearls” stretching from China to the Red Sea and as far as Namibia’s Walvis Bay on the Atlantic coast—have not materialised. The Walvis Bay rumour seems to be a red herring. China has used its ships and soldiers to protect its own citizens in Africa and the Middle East: in 2011 it evacuated 35,000 of them from Libya and last year one of its ships rescued 600 from Yemen. But its main naval focus remains the South China Sea. Japan’s latest spending spree on infrastructure will speed economic growth on the continent; but there is a degree of one-upmanship and duplication. Japan recently handed over the keys to a new cargo terminal at Kenya’s main port in Mombasa. Meanwhile, a short hop down the coast at Bagamoyo, Tanzania is building east Africa’s biggest port—with Chinese cash. On the diplomatic front both Japan and India are trying to make common cause with African states that want to reform the UN Security Council. They argue that Africa deserves permanent seats on it, as do they. China favours a permanent seat for an African country, and it doesn’t mind India having one. But in return it expects endorsement of its stand against Japan getting a seat. Both Japan and China back up such diplomatic efforts with aid and, at least in China’s case, this seems to have helped win it friends. Countries that vote with China in the UN (for instance over Taiwan) usually get more cash from it, according to AidData, a project based at the College of William and Mary in Virginia. China also makes African friends by selling arms. In the five years to 2015 it nearly doubled its share of weapons supplied to sub-Saharan Africa, from little more than a tenth of the total to almost a quarter, according to the Stockholm International Peace Research Institute, a think-tank. It has sold tanks and jets to Tanzania, armoured vehicles to Burundi and Cameroon, and missile launchers to Morocco, to name but a few. It also wins friends among the continent’s war criminals through its policy of “non-interference” in the internal affairs of other countries, for instance by opposing the International Criminal Court (ICC). Yet apart from South Africa, which has slavishly aligned itself with China (for instance by voting with it against a UN resolution to protect the right of people to hold peaceful protests), most African countries are good at playing off rivals against each other, says Alex Vines of Chatham House, a London think-tank. Many have diversified their diplomatic links by opening new embassies, including ones that cross previous divisions between rival powers in Africa. Countries including Burundi, Mauritania and Togo, that used to fall firmly within France’s sphere of influence have opened embassies in Britain. “This is a really great time for clever African countries to get really good deals,” says Mr Vines. China has held a lavish parade in Beijing to mark the defeat of Japan in World War Two, showcasing its military might on an unprecedented scale. President Xi Jinping in his opening speech paid tribute to “the Chinese people who unwaveringly fought hard and defeated aggression” from Japan. He also said the People’s Liberation Army would be reduced by 300,000 personnel, but gave no timeframe. China’s growing military power is being keenly watched amid regional tensions. China has several territorial disputes with neighbours in the South China Sea, as well as with Japan in the East China Sea. Ahead of the parade, the US said five Chinese ships had been spotted in the Bering Sea off Alaska for the first time. China’s People’s Liberation Army (PLA) is the world’s largest military, with 2.3 million members. China also has the second biggest defence budget after the US. U.S. President Barack Obama’s upcoming visit to India won’t be his first trip to the country. Mr. Obama and the First Lady last swept through Delhi and Mumbai in November 2010 in a carefully- choreographed charm offensive, addressing sensitive issues such as Pakistan and the U.N. Security Council, while finding time to dance at a high school and speak a bit of Hindi. Much has changed in India since Mr. Obama last arrived on its shores: the government, the prime minister, the number of international coffee and burger chains. Many things haven’t altered however and by the time he leaves next week, the president will be something of an old hand in the world’s largest democracy. By visiting a second time, he becomes the only serving U.S. president to have made two official trips to India. India has for years coveted a permanent seat on the United Nations Security Council. In Mr. Obama’s 2010 visit, he used a speech to the Indian Parliament to back the country’s inclusion “in the years to come” as a permanent member of the council with power of veto. 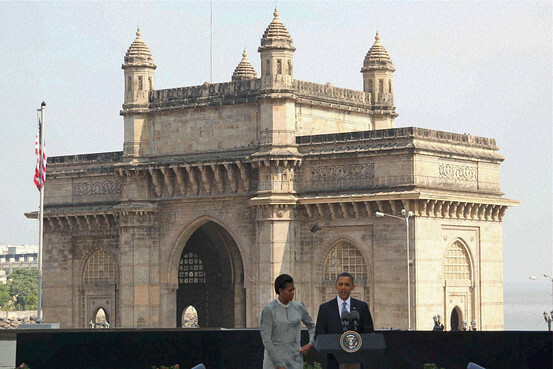 Mr. Obama was in Mumbai when he announced a loosening of restrictions on U.S. exports to India. The move was aimed at making it easier for U.S. companies to export technology for military and non-military use after the U.S. imposed controls on trade with India in dual-use technologies — items that have both military and peaceful purposes – after India’s nuclear-weapons tests in 1998. Mr. Obama asked India to reduce barriers in sectors such as agriculture, retail and telecommunications to promote trade. “In a global economy, new growth and jobs flow to countries that lower barriers to trade and investment,” he said. Ahead of the 2010 meeting, both Mr. Obama and then-Indian Prime Minister Manmohan Singh echoed each other’s language on the relationship between their two countries. “I think the India-United States relationship has entered a new phase,” Mr. Singh said before Mr. Obama’s visit. “There are many Americans whose only experience with trade and globalization has been a shuttered factory or a job that was shipped overseas,” he said, adding that many Americans still had a “caricature” of India as a place with call centers where U.S. jobs have been outsourced. On another touchy subject, Kashmir, Mr. Obama let Mr. Singh do the talking. Mr. Singh said he wanted to reduce tensions with Pakistan, including over Kashmir, but could not do so unless Islamabad cracked down on terrorism. Perhaps the most arduous part of the visit of any dignitary to another country is avoiding any faux pas, embarrassing photographs or poor sartorial choices. Mr. Obama’s staff carefully chose Humayun’s tomb in New Delhi as an appropriate tourist destination for the president. Meanwhile, Michelle Obama’s outfits were carefully scrutinized for any embarrassing mistakes – which she seemed to avoid. Mr. Obama rounded off the whirlwind tour with the crowd-pleasing cry in Hindi of ‘jai hind!’, or ‘hail India!’ at the end of his speech to the Indian Parliament. via Obama’s Seven Habits for a Highly Successful India Visit – India Real Time – WSJ.